The Form No. LIBC-262 Pennsylvania Worker and Community Right to Know Act is a job safety law poster by the Pennsylvania Department Of Labor & Industry. This poster is mandatory for some employers, including public employers (state,county, township, etc.). This poster must be posted in a conspicuous place where all employees can see it. This poster discusses hazards in the workplace and what employers have to do to protect employees from hazardous conditions in the workplace as well as what employees can do if they feel they workplace is not safe enough for them. It appears you don't have a PDF plugin for this browser. 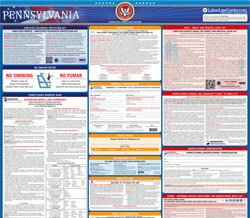 Please see the link below to download pennsylvania-libc-262.pdf. notice informing employees of their rights under the law. at a location where employee notices are normally posted. and must provide a copy to any employee upon request. used or produced in a specific work area in the workplace. assigned to that work area. employee may refuse to work with the substance. Communication Standard must be properly labeled. that employees can easily identify the contents. Health Administration (under 30 CFR 70.210 and 71.210). Compensation, Health & Safety Division.